Parade participants gather in the JJP Parking lot with your decorated bikes, scooters, flags, cars and pogo sticks! The lineup for the parade will begin @ 8:45 in the JJPHS north parking lot on Senior Way. Please register at the sign in table by the JJPHS tennis courts. The parade will begin @ 9:30. 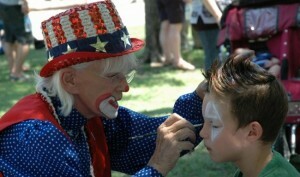 Parade starts at 9:30 at JJP and ends with morning of fun and festivities at Mimosa Park!